The rise of crypto-assets and crypto-assets corporate finance transactions – like Initial Coin Offerings, Security Token Offerings and respective variants – are disrupting the way companies raise funds. At the same time the sudden rise of crypto finance transactions has created unprecedented challenges for regulators, financial market authorities, corporate finance lawyers and professionals. Crypto-assets corporate finance transactions are essentially borderless, global and interconnected. Their borderless nature was the core inspiration of this work. This book, indeed, is an attempt to address to a comparative and functional analysis of crypto-assets corporate finance transactions. I believe it’s neutral, international, functional and short. It’s neutral because while it’s true that the variety of crypto-assets necessitates a case-by-case analysis, it’s unquestionable that some types and hybrid forms of crypto-assets fall within existing securities laws and regulations. Securities offerings, however, are highly regulated in most developed jurisdictions, while, by contrast, the rapid rise of these crypto-assets corporate finance transactions is very likely nothing else than a mere market response to overregulation. Crypto-assets should be treated as a new type of asset whose use – currently falling within existing regulations – should be governed by new and ad hoc regulations, above all in the securities field, in order not to disregard their unique operational and technological features. Existing securities rules and best practices are frequently nonsensical or even counterproductive in the context of many crypto finance transactions. Regulation is certainly necessary to allow crypto-assets and crypto-assets corporate finance transactions to achieve their potential, but the regulatory system should have an appropriate balance and a high degree of clarity. I believe, however, optimal regulatory structures will emerge and converge over time. The final part of the book, then, sketches some proposals for regulators – based on a weighted approach – that, if adopted, would enhance legal certainty and seek to balance support for innovation and investor protection. It’s international because it contains summary information on the securities law regimes in Australia, Brazil, Canada, China, EU / EAA (Austria, France, Germany, Ireland, Italy, Luxemburg, Netherlands, Norway, United Kingdom), Hong Kong, India, Israel, Japan, Nigeria, Russia, Saudi Arabia, Singapore, South Africa, South Korea, Switzerland, United Arab Emirates, United States, including the principal prospectus exemptions and private placements rules in each jurisdiction. Securities offerings are highly regulated and significant civil and criminal penalties can be incurred as a result of offerings which are not authorized by the relevant authorities or compliant with the applicable securities regime. This is why crypto-assets corporate finance transactions falling within existing securities laws and regulations can’t be conducted assuming the law doesn’t exist – in the meantime specific regulations arise. It’s functional because with regard to crypto-assets with real intrinsic usage (non-speculative crypto-assets) this book discusses how a proactive self-regulation, ethical human behaviors, rigorous due diligence, improved governance, disclosure, investors protection and accountability measures could be applied to lead to better quality Initial Coin Offerings, a more sustainable fundraising environment for all the parties involved and mitigate risks due to regulatory uncertainty. It’s short because my project in writing this book is to give a quick framework for understanding the most important securities law regimes. 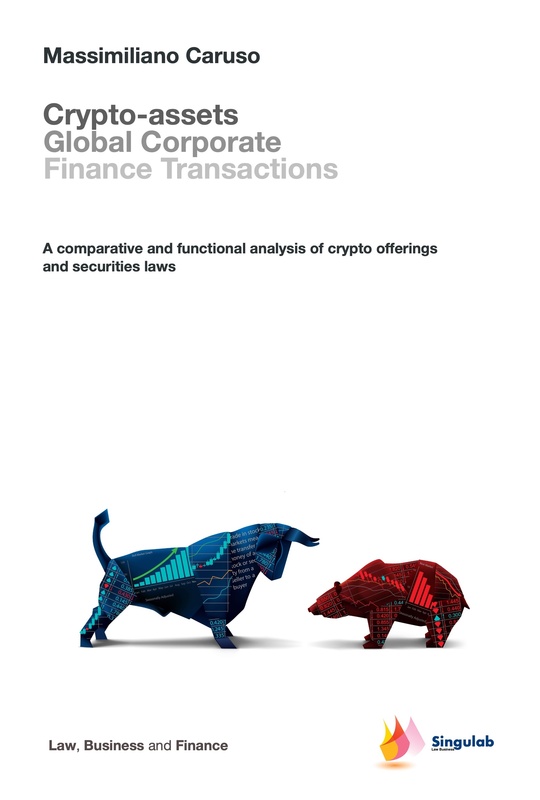 This book is not intended to be an exhaustive guide to the regulation of crypto-assets corporate finance transaction globally or in any of the included jurisdictions. Instead, for each jurisdiction, I have endeavored to provide a sufficient overview for the reader to understand the current legal and regulatory environment. I hope that it remains short enough to attract the readers I would like to reach: (i) my colleagues in international business and corporate law and related legal fields (who can start from these frameworks to make a more detailed analysis of the securities laws in the core jurisdictions summarized in this book); (ii) regulators and lawmakers (with the hope they will find this book a helpful guide to develop new strategies, policies and regulations); (iii) crypto-assets issuers (with the hope they understand the importance of being compliant with the law – even if and when, on the spot, it seems economically irrational – and the reasons why the current measures have arisen in the wider corporate world over time).